When you match the best off road vehicle in the world with the best all-terrain motorhome you create go-anywhere luxurious and reliable travel options in the form of the Mercedes-Benz Unimog and the EarthCruiser ultimate expedition vehicle. For 2018, EarthCruiser has released its most advanced expedition model based on the Mercedes-Benz Unimog U430. With 300hp of German engineering to carry the EarthCruiser Explorer XPR440, the combination of these two leading manufacturers has produced a level of exploration superiority that can literally take a family to experience the tour of a lifetime, and bring them back safely to civilisation. Proven in use by Defence Forces throughout the world, the Mercedes-Benz Unimog features Variopilot, permitting a change between left and right hand drive, moving the steering wheel and pedals in under 30 seconds, meaning you have ultimate safety, vision and control no matter where your journey takes you. Shipping your Unimog EarthCruiser between countries is also easy with the use of container rims. With a fuel range of up to 3500 km, the Unimog EarthCruiser is available with manual or automated manual transmissions. When negotiating severe off road tracks the approach, departure and ramp over angles give Explorer XPR400 amazing access, which can be improved yet further at the request of the buyer. The EarthCruiser Explorer is available in two versions, the XPR440 with its overall length of 4.4m and the XPR380, which at an overall length of 3.8m provides sufficient space to rear mount a motor cycle. 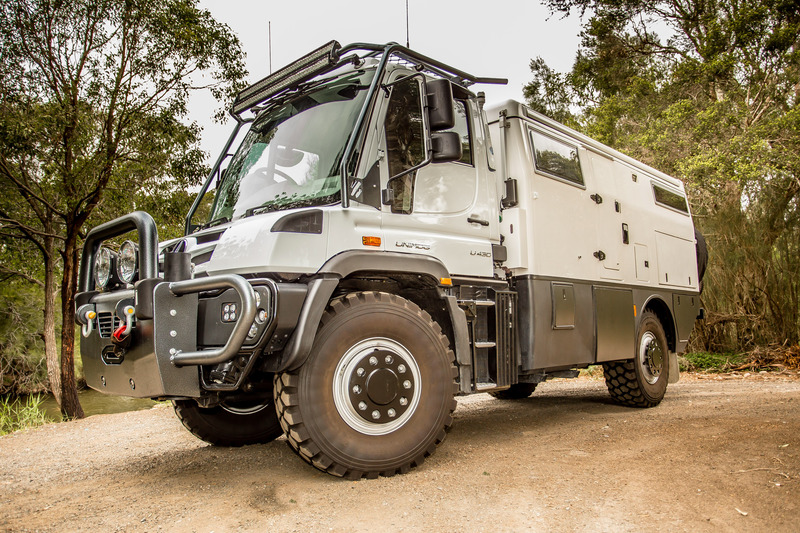 The EarthCruiser Explorer is a purpose built 4x4 all-terrain Expedition Motorhome, with chassis-mounted tank capacity for 860 litres of water and 800 litres of fuel. Dependent on the intended severity of the terrain, weatherproof options are available to cater for extreme cold (-40degreesC) in Arctic conditions as well as extreme heat. Systems controls of up to 140 functions are managed via an IPAD touch screen and customers can select their ideal specification from an inventory that includes run-flat tyres, central tyre inflation and deflation systems, tyre pressure monitoring systems and a four point hydraulic jacking system that raises a tyre and rim assembly off the ground when a change is required. Standard safety and performance features include four wheel coil spring suspension with disc brakes, ultra-low off road gear ratio selection, heated tanks, batteries, pumps and water supply, a 212 litre capacity fridge/freezer plus secondary 68 litre fridge freezer, front and rear mounted 24 Volt electric winches, each rated at 20,000lbs, seating for five (including the driver), queen-sized bed or twin bed options, two sky-beds, a 240 Volt exterior mounted BBQ, together with chain saw and axe. In addition to the standard inclusion of telematics with satellite tracking and monitoring, vision from five externally mounted cameras provide 45 days recording in real time, which may be viewed globally. The EarthCruiser range is available in a variety of formats and sizes to suit specific requirements, together with a choice of host cab chassis from manufacturers that include Mercedes-Benz, IVECO and Fuso. 2018 Earthcruiser Explorer XPF440 based on the Mercedes-Benz Unimog U430, the combination of these two leading manufacturers has produced a level of exploration superiority that can literally take a family to experience the tour of a lifetime, and bring them back safely to civilisation.